The curriculum says students should be able to solve equations that contain fractions. But in my experience, 2P students have a huge mental block when it comes to working with fractions. So I encouraged them to represent the fraction as a decimal instead; easing their anxiety. We talked about how the rounding of the decimal will mean our final answer won’t be dead on, but it will be close. 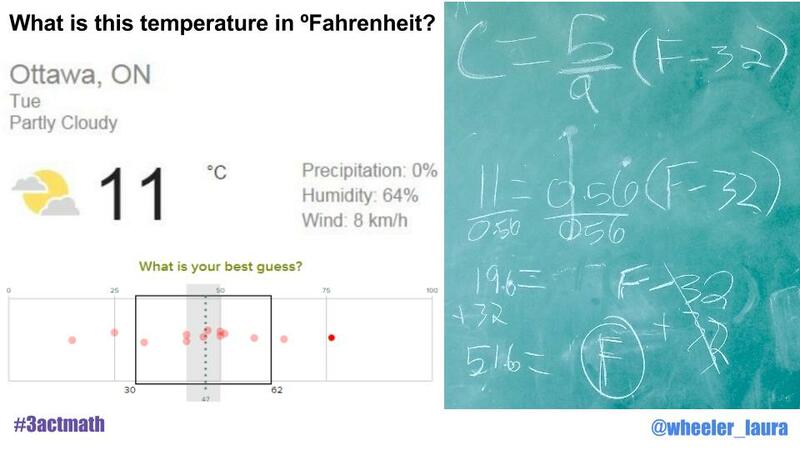 The correct answer is 51.8ºF and one of the groups was able to get an answer of 51.6ºF as seen above which is not too bad! They did have a nice conclusion sentence too, but I didn’t capture that in my photo.